WASHINGTON  A White House plan to broaden the National Security Agency’s wiretapping powers won a key procedural victory in the Senate on Thursday, as backers defeated a more restrictive plan by Senate Democrats that would have imposed more court oversight on government spying. Thursday, June 21, 2007 : A new congressional study has revealed the Environmental Protection Agency misled Lower Manhattan residents about levels of indoor air contamination after 9/11. The report was released during a Senate hearing Wednesday on the EPA's response after the collapse of the World Trade Center. 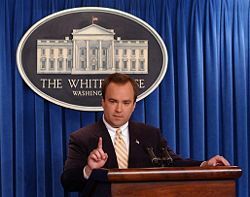 James Connaughton, the Chair of the White House Council on Environmental Quality, was questioned about whether the Bush administration manipulated public information about the health dangers following the collapse. Senators Hillary Clinton and Frank Lautenberg both questioned Connaughton about a 2003 EPA Inspector General report which claimed that he personally edited EPA press releases. Prior to his confirmation as the Chair of the White House Council on Environmental Quality, Connaughton worked as a lobbyist for the mining, chemical, utilities and asbestos industry. According to Michael Isikoff at Newsweek, "The White House is staging a high-level exercise Saturday (today) to test responses to the prospect of a massive domestic terrorist attack involving IEDs (improvised explosive devices)—the same deadly roadside bombs that have been used by insurgents against the U.S. military in Iraq...."
"As part of the exercise, the officials will be handed a thick binder which lays out a scenario involving simultaneous terror attacks by “sleeper cells” of 20 to 25 individuals each dispersed in five cities across the country: New York, Washington, Chicago, Houston and Los Angeles. The officials will then be tested on how they direct their respective agencies to respond. “We’ve designed this to overtax the system, to push the system beyond the breaking point,” said one senior administration official familiar with planning for the event, who declined to be identified talking about it before it takes place...."
Tony Snow skirts around the issues. As you would expect a "Press Secretary" of this Administration to do.